Each time you restart your clock, you're throwing away any time over 1 second. This is going to accumulate more and more causing your countdown to be inaccurate. I modified your code to count down without any accumulation issues. Also, you don't need the header guard in a .cpp file. General discussions / Re: What pain points do you experience using SFML? It's also not very useful for anything but the very simplest case. A rich text component or even just multiline component with text alignment would make a big difference here. This is by far my biggest gripe. I find myself often having to do a lot of tinkering with sf::Text and wondering why I have to write my own functions for things like multi-line text centering. When I asked about it a couple years ago I was told to do it myself. Yeah, that's fine, I'm happy to do it, but it seems like there's a bit of functionality missing from sf::Text that is not just specific to my needs, but rather features that most users would want. I can see why these features might be low priority, but they don't even seem to be on the roadmap anywhere. I found myself implementing common text operations like multi-line text centering as well. I wonder how much effort has been collectively wasted here. I just want to register my appreciation for you making these bindings and making them open source. Works great. Looks good, it's clear a lot of work was put into it. You might want to change the name of it to something more unique. I went to install it on Android and couldn't find it through their search. I had to go find this thread on my phone in order to get the link. General / Re: Difference between creating a window with VideoMode(...) and getDesktopMode()? The FPS cap is 144, which is good I guess. I'm not really sure why a bitsPerPixel of 32 would result in a different cap though. I'll add it to my list of things to do, but considering the fix is to alt tab and then reenter the program, it's pretty low priority for me at the moment. I'll post back here if I find anything. 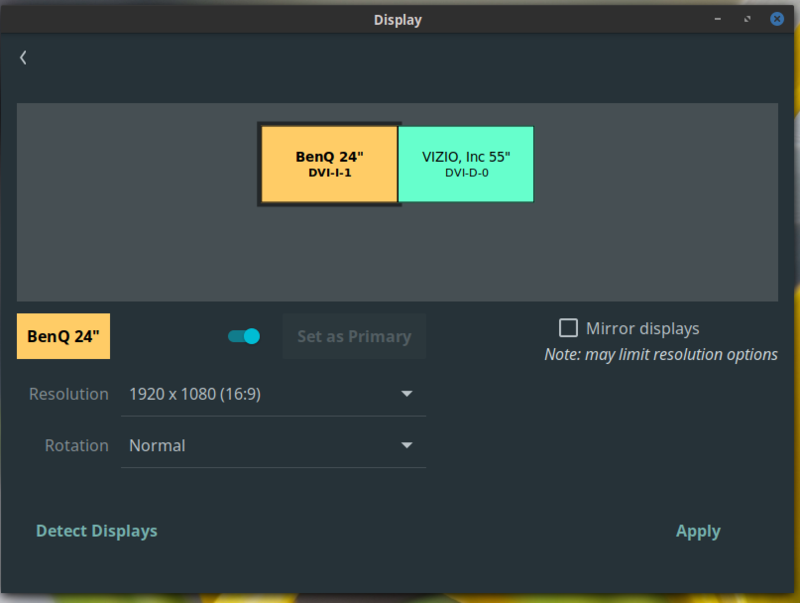 General / Re: Resolution issues with fullscreen on duplicated (mirrored) displays on Windows? I'm going to chalk this one up to a bug in Windows. I just downloaded and installed the April 2018 update and this is now fixed. Thanks for the help eXpl0it3r. Ah so it's more or less just zoomed in. Yeah. It looks to me as if the viewport is smaller than the window size, and it's being stretched to fit. Except it's also affecting the underlying OS. 1. Set windows to only show on monitor 1 and then ran an SFML app fullscreen. It behaved correctly. 2. 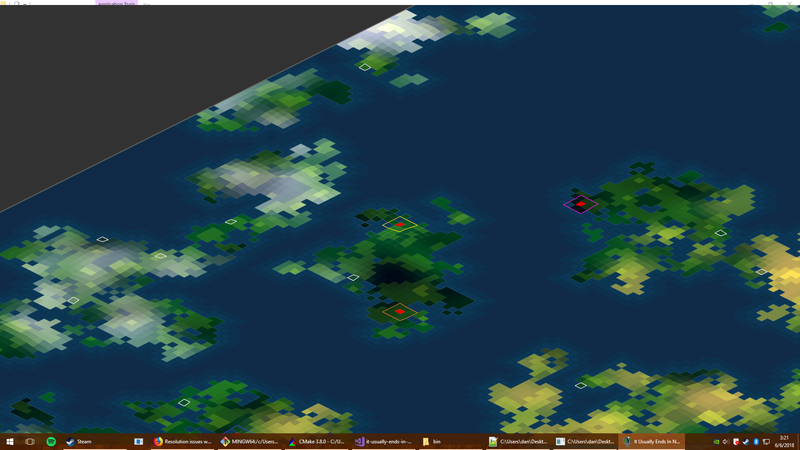 Set windows to only show on monitor 2 and then ran an SFML app fullscreen. It behaved correctly. 3. I decided to try out switching the monitor ordering, so I unplugged monitor 1 and monitor 2 and switched the ports that their cables were plugged into. I then set windows to mirror the displays again. The issue still happens. I should probably mention at this point that one monitor is actually a TV, and is significantly larger than the other one. I'm sure this is a stupid question but is the code that fullscreens it at all DPI aware? Could that somehow be screwing this up? I think this one is more clear. 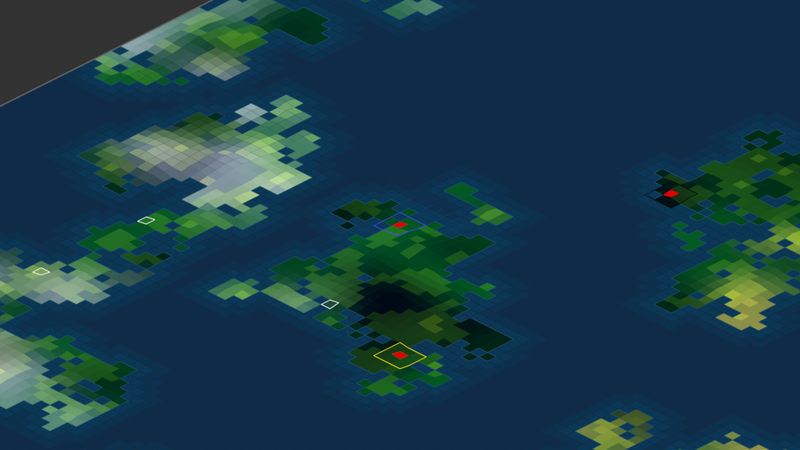 Same map at the same camera position, but one is fullscreen and one is borderless. edit: Just updated my graphics driver to the latest (398.11). Unfortunately the issue is still happening.